This took place over 3 days on the 15-17th June. This is our third year camping- in our opinion the festival was not as good as in previous years with the entertainment and stands but was still full of happy bikers. The ride on Sunday, however was excellent. We rode to the end of the High Peak trail on Friday evening- Simeon came over for the day on Saturday- we organised our own ride to a pub for lunch down the Tissington Trail and then back to the show ground up the High peak trail. We crossed over the trails from Tissington. Simeon then went home. We decided to ride the 60 mile “Sportsman” ride on the Sunday with Cathy on her 1987 Raleigh Caprice and me on the RRA. We did cheat as we had done a recky of the ride some 2 months ago so knew the challenging parts! I think psychologically this was very beneficial. There were four main climbs- one before lunch from Longnor to Earl Stearndale (the shortest and least taxing), the second through Manners Wood at the end of the Monsal Trail (Grim+), the third at Beesley (we called this the Beast of Beesley- grim+++) and the fourth the climb out of Crompton up the incline plains on the High peak Trail (grim++). The food stops were at Thornbridge Hall off the Monsal trail (fantastic with a great venue and lunch) and at Crompton on the High Peak Trail. This is staffed by volunteers from Derbyshire County Council. They always put on a fantastic event for Eroica. All together a great weekend of cycling in fantastic country side! Eroica Britannia 2018 60 mile “Sportsman” route. Total elevation climbed 5748 ft. The RRA at speed. Lovely machine. handles like a dream. Maximum speed registered 39 mph, lowest pushing up hill! The finish. It just started to drizzle! Cathy at the end. She was probably the only rider to complete the 60 mile ride on a Sturmey Archer 3 speed on a bike made of gas pipe! Amazing but she loves it. She use to tour on a Raleigh Caprice in the 80’s with her friend Zia. Places she has toured on one include Devon and Dorset, the Cotswolds, IoW and Denmark. What a gal! She would be a demon on a lightweight. The RRA was out on all days over the Bank Holiday weekend. On Saturday I was out with the Cheshire Wheelers in Knutsford Royal May Day. All the main streets are closed- a procession winds its way around the streets of Knutsford. The whole town comes out to support the procession. 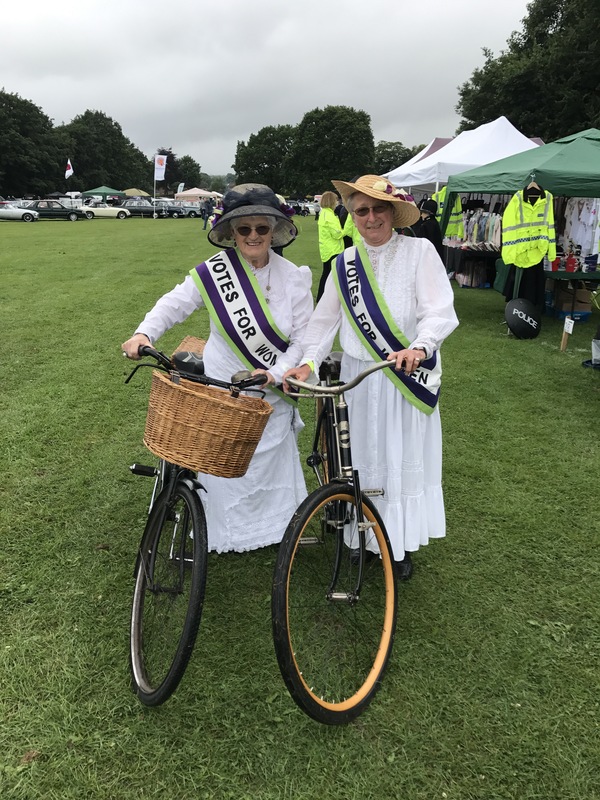 The Knutsford Royal May Day dates from 1864 with it receiving it “Royal” status in 1887 when the then Prince and Princess of Wales (the future Edward VII and Queen Alexandra) visited Knutsford May Day. 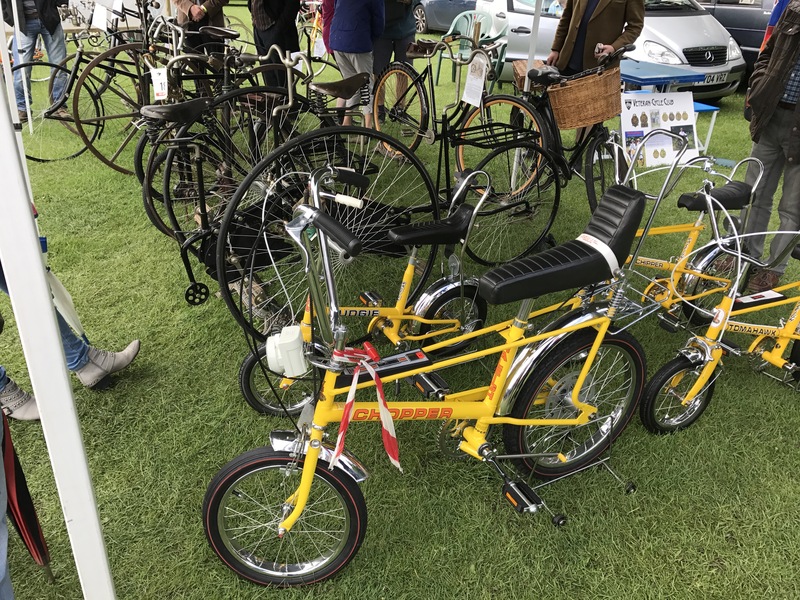 I was with the Cheshire Wheelers which represents cycling from its inception, from a Hobby Horse, through the advent of the Penny Farthing (ordinary), early “safeties” to the light weight era that I represented. A fantastic day with glorious weather. A couple of pictures are shown below. To me the highlight was a very rare 1954 Reg Harris track bike, utilising the RRA frameset. This had a Williams chainset, BSA cranks with RRA pedals. A fantastic machine. This is owned by a VCC member. Note the RHH on the seat tube. This was common practice to replace the RRA with the riders initials. This stands for Reginald Hargreaves Harris. It is amazing to think that it was 70 years ago this year in 1948 that Reg – in close sequence – smashed his ribs and back in a car crash, broke his elbow in a cycling crash, and won two silver medals in the London Olympics on his RRA! 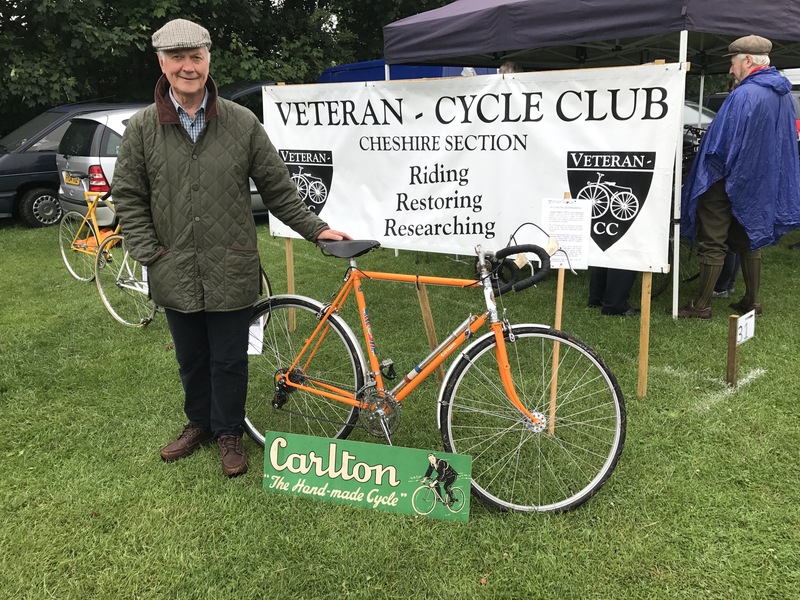 This was the first time I have organised the Lightweight ride for the Cheshire Section, this having being the preserve of Bob Bennett for many years. Eleven intrepid explorers arrived at the Courtyard coffee house in Knutsford full of glee in glorious morning sunshine for the start of this ride. The weather was ideal, blue sky with sunshine but was not too hot. Most people see Knutsford services on the M6 and never visit the town. It is a pretty Georgian town, being the setting of Elizabeth Gaskell’s “Cranford” and is full of history, originally being the town that served the neighbouring Tatton Estate. Henry Royce of Rolls Royce fame lived in Leigh Road, Knutsford at the time of his forming the partnership with Charles Rolls in 1904. Leigh Road also made a guest appearance in Steven Spielberg’s film “Empire of the Sun” (1987), doubling up as colonial Shanghai. We set off across the Knutsford Moor (adjoining Tatton Mere) and under the railway bridge to Mobberley Road. Although only a B road this connects Wilmslow & Alderley Edge to Knutsford so is fairly busy. After a short while we turned off this road and headed into the Cheshire Countryside to Warford, then on to Nether Alderley, part of Alderley Edge. We picked up a cobbled track here which was likened by a few of our riders to that of the Paris–Roubaix race! Although Cheshire is considered flat it does have its lumps where it borders on the Peak district to the East, Shropshire to the West and Staffordshire to the South. This did not go unnoticed by Peter! Alderley Edge is packed with folklore- it was also the site of copper mines going back to the Bronze age. These are open certain times of the year and are a sight to behold with vast underground caverns- something hard to believe when walking or cycling on the surface. A gradual ascent was made followed by a good descent down to the main Chelford-Macclesfield Road. On this road we passed a beautiful church, St Catherines, on the right. This is unusual in that it has an octagonal tower and is also known for having beautiful German and Dutch stained glass. It is listed in the top 1000 churches in Britain. Crossing this road we went around the back of Redesmere lake. This was where Ben Ainsley learned to sail as a youngster and won the RYA club of the year in 2016- a great achievement for a land locked sailing club. From Redesmere we headed into the deep Cheshire countryside surrounded by fields of wheat and cattle, indicating the rich diverse nature of Cheshire’s agricultural base. Our Lunch stop, which was over half way, was reached early afternoon at the Swettenham Arms in the picturesque village of Swettenham. Here we sat out in the gardens, adjoining a field of beautiful blue lavender. We had a lovely mixture of freshly made sandwiches and chips! Following a good break, setting off from here, for a bit of fun, I decided to go via a local ford. This has a concrete base so is quite safe. Me. The RRA was thoroughly cleaned and dried afterwards! This was enjoyed by everyone but was a lot lower than when I first checked out the route for the ride in March! Heading back through countryside we passed through Goostrey, which is close to the radio telescope at Jodrell Bank, and then to another off road section through the Peover Estate to the main Knutsford-Holmes Chapel Road. We cycled for a short way along this busy road and then turned down another small lane. This led to the “Tree of Imagination” where we stopped. This has been carved from an old tree stump in the form of a fairy’s home- it has now become quite an attraction in the area. It was originally quite an eyesore- the local parish council held a competition as to what to do with it- fortunately the carving won the day! Heading back into Knutsford we finished the day with a lovely ice cream on the Moor. Altogether a glorious day with great company! Another great day. Started a bit wet but brightened up over the day. 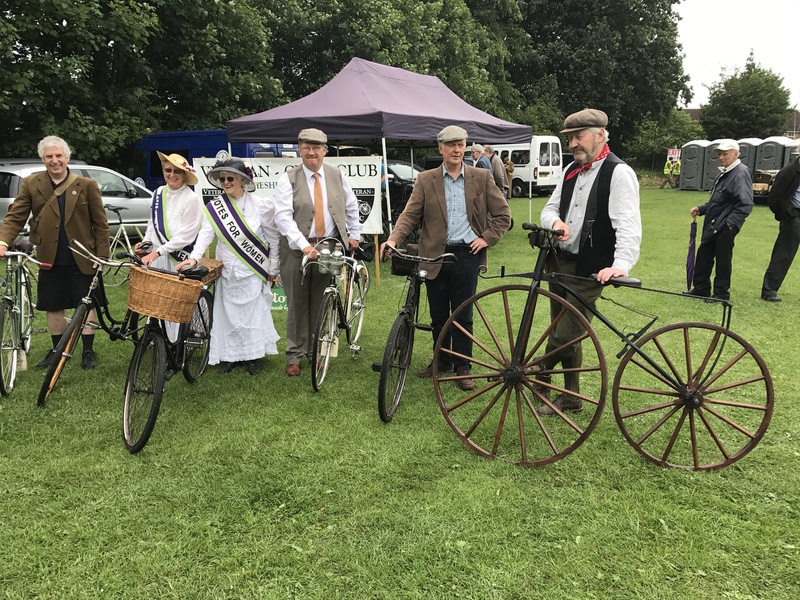 The festival started with a procession through the town with the cycles taking part in a cavalcade of vintage vehicles- we then displayed the machines within the VCC area. Many interesting exhibits including some really old machines from Paul Adam’s collection. The day was busy throughout and included a replica Spitfire within the show ground and a fly over of another Spitfire in the afternoon. Me and the RRA. Dave Cane’s beautiful colnago can just be seen to the left. I should have taken a picture of this as it was truly excuisite. 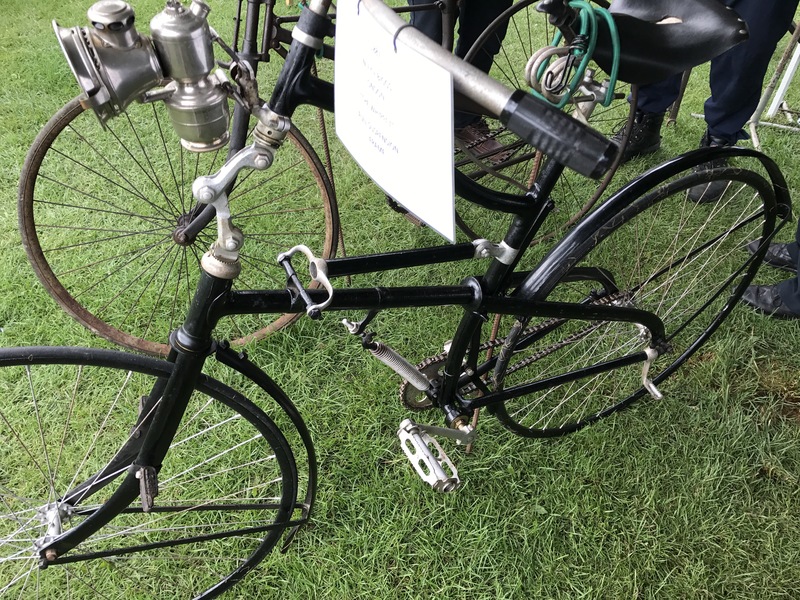 Paul Adam’s 1887 “Whippet” with full suspension, predating the Moulton by some 75 years! This was a fantastic event- the sun shone and the ground was dry. Both the Saturday and Sunday rides were in hot weather. This year the event moved to Friden Grange, not far from Bakewell. This was a good call- the site was much bigger than Bakewell and better organised than last year. The site had direct access to the High Peak trail. On Friday evening we cycled up the High Peak trail with my wife Cathy on her Raleigh Caprice “Doris” to the Royal Oak pub at Hurdlow and then back. I got a puncture on the way back and found out I had a spare inner tube with the wrong valve! This required a push back but was only about 2 miles. On Saturday we had a ride with the Midland group of the VCC- up the High Peak trail, leaving it at Parsley Hay. I was on the RRA, Cathy on Doris, her Raleigh Caprice. It was very hot! We came back via Hartington, Hulme End (along the Manifold trail) and Ilam where we had lunch. Another puncture in the RRA (rear this time) indicated that the tyres were pumped up too high. With the hot weather and hills too much heat was been put into the rims (Conloys) causing the inner tubes to be pinched under the tyre bead. I dropped the pressure in both tyres to around 55 p.s.i.- no problems after this! The group had 2 more bikes with punctures caused by the same issue. A really good ride through beautiful countryside! We set off at about 9:15am and covered the 25 mile tourist ride. This started with a run right up to the end of the High Peak trail, past Parsley Hay and the along Upperblindlow Lane, Netherblindlow lane, Flat Lane and Moor Lane. These are beautiful white gravel lanes- real Eroica roads!. Eventually we arrived in Monyash where we had lunch, accompanied by a brass band- quintessentially British! This was after about 14 miles. The run back started with a climb from Monyash to the Tissington trail, with a link back to the High Peak trail via another white gravel track back to the High Peak trail and the Eroica show ground. This was a bit of a surreal day. 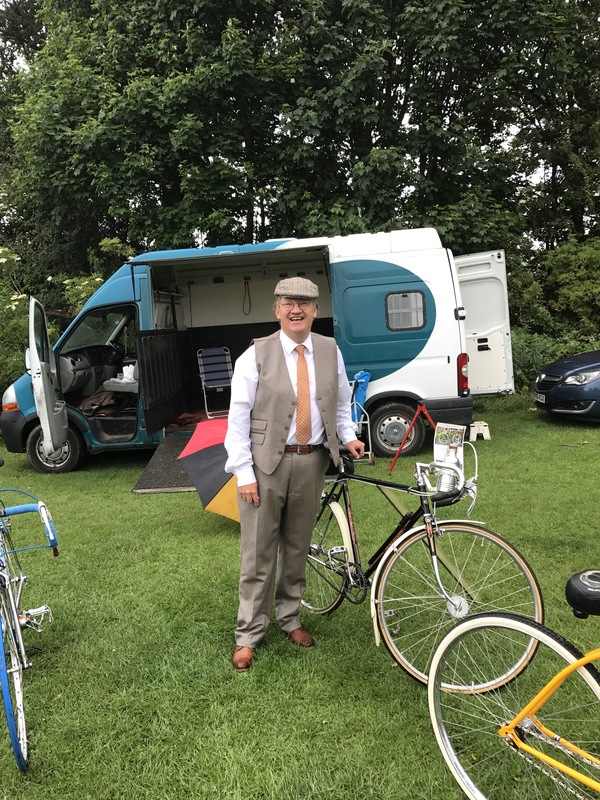 I only entered the RRA into the Eroica Britannia “Best Bike” competition by chance last week in the best pre 1949 category. I am not a cycle restorer. 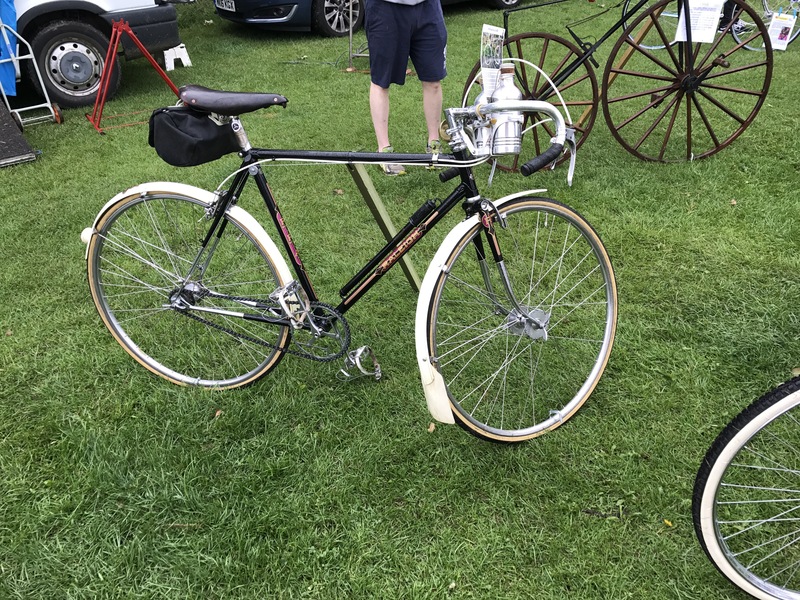 I only have ever restored one bike- my Dad’s Raleigh Record Ace. I was pretty amazed to be selected in the best 3 of class. Judging took place on the Saturday morning at 10:00 am. Thinking that that was it- I was happy to be placed into the top 3 of class (there were some gorgeous cycles in the competition). I went on a 20 mile ride with the VCC to a pub for lunch at Chelmorton which also included my wife and daughter. I got back at about 4pm and dusted off the bike for the final judging at 5.00pm. The final judging was running a little late but I won my class. I was amazed! After judging of the other classes I entered the final and was named “overall winner”. I won an Elephant Bike. I have given this to my daughter Marion as her student bike at University. She starts in September and is reading Medicine. On Sunday I completed the 55 mile “Sportsman” ride on the RRA. My Dad has obviously been looking down on us this weekend- he would have been tickled pink that his RRA had won the day! A week last Sunday we went on a cycle ride with the Cheshire Section of the VCC (Veteran Cycle Club) around the lanes of Cheshire. The RRA performed faultlessly over the 20 odd miles. There was a mixture of machines with some over a hundred years old. A fantastic time was had by all in glorious sunshine. Additional content, including pictures to be added shortly!